Xi Hu Long Jing Green Tea is unquestionably the most famous green tea in China and commonly known worldwide. 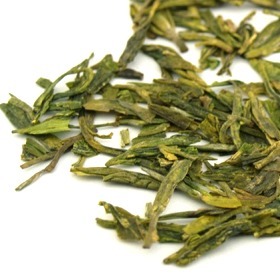 Grown originally in the Long Jing mountain area of Hangzhou, southwest of the West Lake. This tea is also one of Chinas top ten teas. Xi Hu Long Jing has more than a thousand years of recorded history and was mentioned in the first ever tea book (Cha Ching) by Lu Yu during the Tang Dynasty. This batch of Xi Hu Long Jing is certified pre-Qing Ming tea, which requires it to be produced from the very tender spring shoots prior to the 5th of April each year. This harvest period produces the best Long Jing through out the year. This tea produces a strong nutty aroma and flavor. If you are Long Jing lover you will definately like this tea. Tips: It is better to keep this tea in the fridge/freezer to maintain the freshness of the tea. Delicately sweet with a refreshing meadow-like flavor, deep fragrance, very smooth, flavor similar to chestnuts with a sweet aftertaste. Evenly-sized, flat and narrow tea leaves comprising of one bud with one-to-two leaves variety. The color is yellowish jade-green. The infusion is very clear and light in the color which shows a slight pale yellow-green. Bought this tea after reading about the review from other writers. A tremendous tea that deserve to be a top tea in the world! Best Lung Ching I have ever drank. A must if you are looking for high grade Lung Ching. Very interesting tea. First brew I thought it was a little stinky. Ive never had a green tea like this. Took lots of leaf and color stayed quite light green. Still remained a little stinky. Drinks nice though and tastes nice. I think I can enjoy this even though I enjoy a more subtle tea, this one has some strong flavors working for it. Known to be consistently among the best of green teas. To be honest I havent tried any others except this one. But I was definitely pleased. First steeping can become quite strong if left too long or too hot (I brew in a Gaiwan and drink straight from it). Taste is an excellent nutty pistachio on the first steeping that calms out to a pleasant sweet nut maybe something like mild chestnuts on subsequent steepings. Quite like what I had bought when I visited Xi Hu in China. Tea was satisfactory. Could be better if it was more consistent throughout, meaning some leaves did not appear to be Long Jing. I like it wery much! Fresh, invigorate, all-day-long tea. You won`t be disappointed. Very light colour drink indicating good quality green tea.